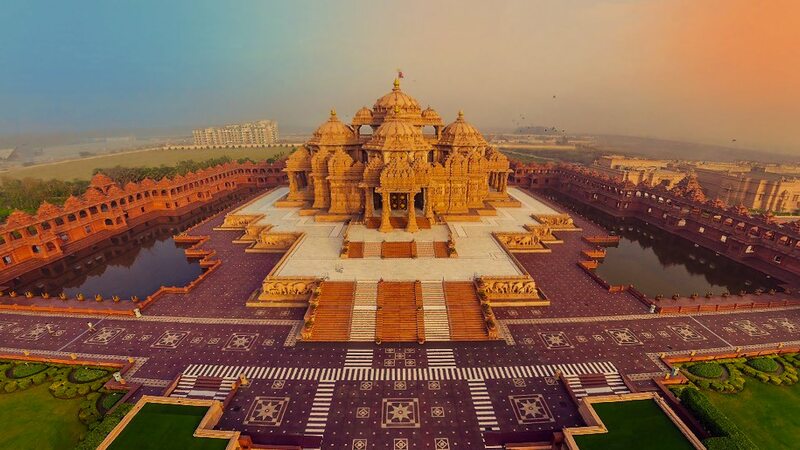 AKSHARDHAM – All About India ! ABOUT : The full name of Akshardham is Swaminarayan Akshardham Complex and it is one of the most popular temples in India, which is the major source of tourist’s attraction in Delhi and attracts about 70% of the total tourists of Delhi. Akshardham sets a Guiness World Record for World’s Largest Comprehensive Hindu Temple. The complex was built in the period of 2000 to 2005 and was officially opened on 6th November, 2005 and was inaugurated by honorable Late Shri Dr. A.P.J. Abdul Kalam. Akshardham Temple – It is 43 meters high, 96 meters wide and 109 meters long consist of 234 carved pillars, 9 domes, 20000 murtis of sadhus, acharyas and devotees and 148 life sized elephants. Under the central dome of the temple, the murti of Swaminarayan is seated in abhayamudra. Hall Of Values – The Hall presents 15 3-D dioramas which are related to some incidents from Swaminarayan’s life. With the help of the robotics, fibre optics, lights, sound effects, dialouges and music, these dioramas convey the message about the importance of devotion to God, humility, peace and service to others. One of the Biggest Theatre – It consists of one of the largest screens of about 85 feet wide and 65 feet high. Theatre plays a movie of duration 40 minutes about the religious journey of 7 years made by the Swaminarayan during his teenage time. Amazing Boat Ride – In a 15 minutes boat ride you will see the contribution of Vedic Indians to the different fields like science of ayurveda, arts, mathematics, yoga, literature etc. Musical Fountain – It is also known as Yagnapurush Kund. This fountain has the largest step well in india, the series of steps of well going down to the Yagna Kund. During the day time, tourists sit on these steps to get some rest and in the night time they sit to enjoy the fountain show. The musical fountain show conveys the message about the circle of life. Beautiful Garden – A very beautiful garden is built inside the Akshardham complex consists of different sculptures of freedom fighter, national figures, warriors of India, children, women and the remarkable figure of Mahatma Gandhi. Previous The Unveiled story of Indo-Sino war’62 at Rezang La !! Pingback: DELHI – SOUL OF INDIA – All About India !